AFAS Artist Barry Rowe tells Marcel Haan why lighting and atmosphere is so important to him and why he loves to bring romance into his paintings. 'Being True to Yourself' . Barry, I see that besides painting, you also have sketches in a book which is advertised on Amazon. There is one sketch which is quite small about 16 cm. The publisher blew it right across a double page spread and it came out beautifully. 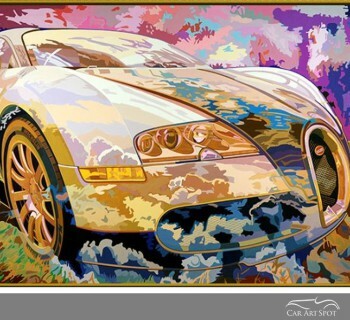 How did you get started in creating automotive art? I have always drawn, right back from when I was five or six years old. My dad used to work for Jaguar and I would cycle around the back of the factory where there were 'C types' being built for Le Mans and I used to watch them being put together. Were you allowed to bike around there as a child? This was a long while ago don't forget, when security wasn't as good as it is now. But I was only a youngster and I used to cycle straight past the works policemen, leave my bike at the back of the competition shop and just walk in. Nobody ever told me off. I did this quite a few times. This was the start of my excitement of seeing these cars which you didn't see on the road. When the Jaguar XK120 was coming out in 1949, my dad got me some photographs of the car and I did some sketches of it. That was the first real car I ever drew. Very difficult shapes, beautiful things. Strangely enough I've got a Christmas card to do of an XK120, which is my next job. It's for the Jaguar Owners Club. I have always earned a living by drawing and painting. I went to an art school very briefly, only for a few months. My friends' older brother was an animator in a studio and he looked through my work and told me that I didn't need to go to art school. He told me to get myself a job in an advertising agency as a tea boy and said I would learn a lot more. You can't obviously do it these days because you need a degree, even to get an interview. But I got a job as a tea boy and within two years I was an art director, directing photography etc. I was only 17 or 18. One of the photographers I used was a car enthusiast and he used to go to circuits for a magazine called Sporting Motorist. He asked to borrow some of my drawings and showed them to the editor. The editor commissioned me to do front covers. The magazine couldn't pay very much. I think it was 20 pounds which was obviously a long time ago. But they said they could give me tickets to motor races as well, which was really good. I went to Monaco, Le Mans, Nürburgring, Spa. I saw a lot of the classic events and all the drivers very close up. Again, you can't do that today. I've always had an interest with motorcars but was still doing my art directors job at that time. So your interest in cars was something you did in your spare time. Yes, it was cars in my spare time but I left the advertising agency and went to work for another company who did car brochures. 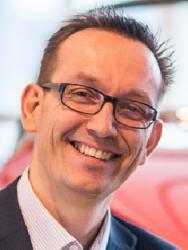 There I did some illustrations for mostly British motor car companies and did quite a lot for Austin Healey. At that time the car industry was quite buoyant but of course they have all gone now. In 1966, I went free lance and one day I called into Corgi Toys which was a cold call. It was almost lunch time and I just walked in and asked if anyone could look at my work. This guy asked me to come into his office and after seeing my work, told me that it was just what they were looking for. They were changing all their advertising to a fresh look and said 'this is it'! It all went quite easy and I couldn't have been luckier. I did a lot of stuff for their brochures, t.v. characters like Starsky and Hutch; a whole pile of illustrations. So that happened because you were brave enough to walk in to do a cold call? Absolutely. I was so naive and just walked straight in and was very lucky. That was soon after I went free lance, so it was perfect timing. I think a lot of artists are held back by fear of rejection from doing something like that. Being rejected didn't cross my mind and it paid off. It was good and from that incident, Bosch approached me to do illustrations for a book. They were bringing out a book called 'The Bosch Book of the Motor Car' (published by Collins) and asked if I would do the illustrations. It turned out to be a massive book with about 350 illustrations. It was all about the units in a motor car. That was in 1975. I guess that was quite different from your artwork? Yes, I used to use lines and inks and that sort of thing which I don't do now. I do paintings in frames. Also, how it needs to appeal to the viewer is different now. Oh completely. The job started out as them wanting vintage cars with people in it. I did them as sketches but then they wanted cutaways and some of them were quite technical, but I managed to get them to accept quite a free style. Almost like a sketch. For a cutaway drawing you need some understanding of the technical details. Yes and I was doing the whole thing against the clock. I worked for nine months including weekends to do about 350 illustrations and some of them were quite complex. I had advertising deadlines to meet which was good training. I had to go straight in and get it right the first time. I continued illustrating but in 1994 I entered an art competition by Sotheby's in London and won! The brief was 'Record Breakers' and that was all the information I had. I did quite a large painting of Sir Malcolm Campbell Bluebird. I packed it all up and was really pleased with my painting and my wife said 'why don't you send that little portrait of Juan Fangio'. But I told my wife that a small parcel on top of the large packaged painting would look stupid, but she said 'do it'. So I sent them both off. Sometime later, I was lecturing at an art college and my wife phoned and told me that Sotheby's' had phoned to say that I must be at the awards night. I told her that I hadn't got the time. Eventually Sotheby's rang again and said that I must come. I thought maybe I had come third, never thinking I had won it. At that time the prize was 10,000 pounds which was quite good in 1994. They told me to 'come for lunch'. So I went to Sotheby's and they took me across the road to quite a small cafe, nothing very grand at all. There were three men talking to me with a vacant seat at the table and they didn't mention anything about art. They just kept talking about cars and I assumed they were going to tell me I had come third but then a man came in, who was a top man at Sotheby's. He asked me where I was going that night and I told him we were going back to our home in South West of England. He said he thought I would be going to the Bahamas. I asked him why he would say that and he said 'Well you've won of course'. That shock gave me a heck of a headache! He told me to keep it under my hat and not to tell a soul. After lunch, I met up with my wife, who had been shopping, and I told her. We both couldn't believe it. We went to the awards and Stirling Moss presented me with a cheque, which was very nice. I got back home and there was a fax message which said 'Please come to Paris, we want you to do some pictures for our windows'. I wondered who it was and called the following day. It turned out to be Louis Vuitton. They commissioned me to do some paintings which they then used in all of their windows worldwide. 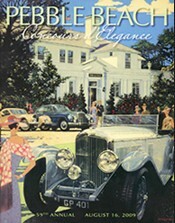 They were all to do with old motorcars and events and they had chosen me because I had won the competition and the colours I had used were exactly the same as their new range of ladies fashion handbag line. It was again amazingly good luck. This launched me into not just being an illustrator but also an artist which led to other things. I did quite a lot of paintings for Royal Caribbean Cruise ships and for Queen Victoria ship Cunard. Was the award the tipping point for becoming a full time artist? Yes it was. Before that I was an illustrator doing quite a few illustrations of cars but also all sorts of things, even childrens' books. 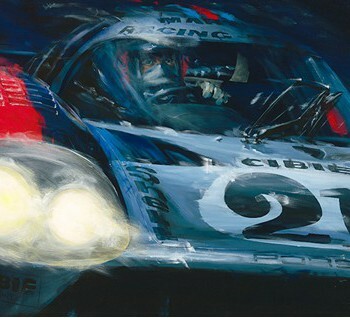 Was it the small painting of Juan Fangio that won the prize? Yes it was. The big painting I did came fourth. So it was a good thing my wife told me to send my Fangio painting. The title of your book is called Atmosphere and Light. Do these two words describe your work Barry? The author was Gary Doyle who is an American. He came up with the title. I met him at Pebble Beach where I had on exhibition some Duesenberg racing cars at Le Mans. One of Gary Doyles' relations was Murphy and he was one of the drivers from Duesenberg. He bought this big painting from me at Pebble Beach and commissioned me to do other paintings of Duesenberg racing cars. That is how we got together and he's been a very good friend to me. We have been to European races together. Besides the car, you put a lot of attention into the settings and environment in your paintings. Yes and to me that's very important. I can't just do a car. I think that's cheating. I can be anywhere and it's the light which attracts me. I might see a scene where the light is so nice but has nothing to do with cars at all. Then I put it together with the cars and make a story or a scene. Looking at your painting of the blue classic car in front of a terrace full of people on a lovely sunny day, the car is the main focus and yet it is not. Actually Marcel, my wife pointed something out to me which I hadn't realized. When I have my paintings on exhibition and couples look at my paintings, it's often the girl who likes them and tips the sale. So I think my paintings attract the ladies. I like the vintage period cars. I think there is more romance in there. I like the peoples' dress and putting it altogether. You explain that it's the light which captures your attention and you then make it into a story. How does that come together? I take stacks of photos of old cars and lighting etc. It could be the background that starts me off or it could be the car and then I find a background. The lighting is never dead right. You have the light coming at an angle on the car and other lighting coming from the background. You have to get it altogether properly, otherwise it's not believable. I like old pictures of nice dresses and something romantic in a way that isn't there now. Stories about people such as The Great Gatsby. It fires me up. Very often I am not thinking about doing any pictures and then suddenly I come around the corner and there it is... the spark! It's mainly the lighting that starts it. What is it that you want to trigger in the audience? This is not intentional but I like things to be different to everybody else. It is just a style which attracts me, hoping that it pleases the viewer as well. If I am correct, the size of your artwork is quite large. I do a lot of very small pictures (10 x 8 inches) and they sell like hotcakes but the biggest pictures I do are 4 ft by 3 ft (20 x 30 inches/30 x 40 inches). This is strange thing, some years ago I was at Goodwood and I saw two girls in an art deco Bugatti, with a very designed frontage. I took a shot with these two girls in and did a painting. 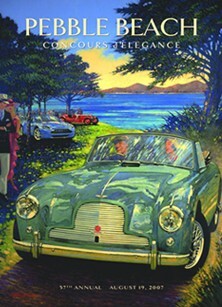 I made them into more art deco fashion girls and put my painting on exhibition at Pebble Beach. This guy came up and didn't speak, he just pointed to the painting and bought it. It was a very little picture and I did another one the following year. The same man came up, pointed to it and bought it. He's been doing this for the last nine years. I have never spoken to him and he has never spoken to me. He just comes, smiles, points to it and takes it. I title these pictures 'fast ladies' and they are always two ladies in period. He's got nine and of course I have to do one for this years' Pebble Beach. He's like a mystery buyer. I interviewed Princess Vidita Singh and she was talking about the Indian Vintage cars. Could it possibly have been an Indian Royal? No but a couple of years ago the theme was 'Cars from India' Rolls-Royces and this magnificent gentleman with a big white beard and a gorgeous Rolls-Royce came to me and asked if I would like to paint his car. He turned out to be a Maharana. He asked if I would like to come to India. He sent one of his servants up to my hotel and gave me a very large book of his cars and another book about his daughters' wedding which lasted 3 weeks. He's written to me a couple of times but I've never been to India. It's still on the cards and I hope it does come off because the experience itself would be really nice. With so many great works of art, are there still things on your list which you want to paint? I want to paint all the time. I've been lucky. I've done 18 posters for Pebble Beach and lots of things that I have always wanted to do. I do lots of commissions. In fact, I was at Brooklands where I had done a post, and there was a lady sitting next to us. I thought I had seen her before and she turned out to be Donald Campbells' daughter. Her grandfather started with Bluebird (Sir Malcolm Campbell), then her father and then herself. She was a speed boat champion. We got talking and she commissioned me to do a large painting of the dynasty of the family and invited us up to where she lives. She showed us all the artefact's of the bluebird racing car, speedboats and it was really fantastic. My painting turned out to be about four paintings in one painting. 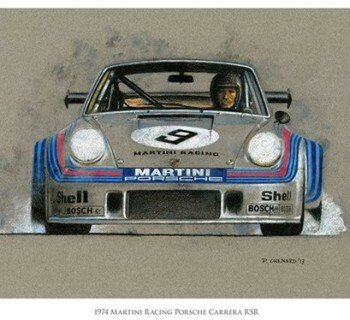 You have been doing very well with your automotive art. I often hear that automotive artists struggle to get exposure because of being stuck in a niche. What is your opinion? Although cars are my real interest, I have painted all sorts of things. If you look at lots of the impressionists, they used to paint ships, trains and other transportation. I think a lot of old cars are romantic beautiful things to paint but lots of people who buy my paintings do not only have collections of car paintings. I've been to several peoples' homes where I have been commissioned to do a painting, and they have old masters on the walls. I don't think there is a stigma. Particularly in America. I think they like to display their car on the wall. If it was just a car, I don't think it would succeed. I think it needs to be a period picture, with the car who would have owned and driven that car. A complete historical scene. 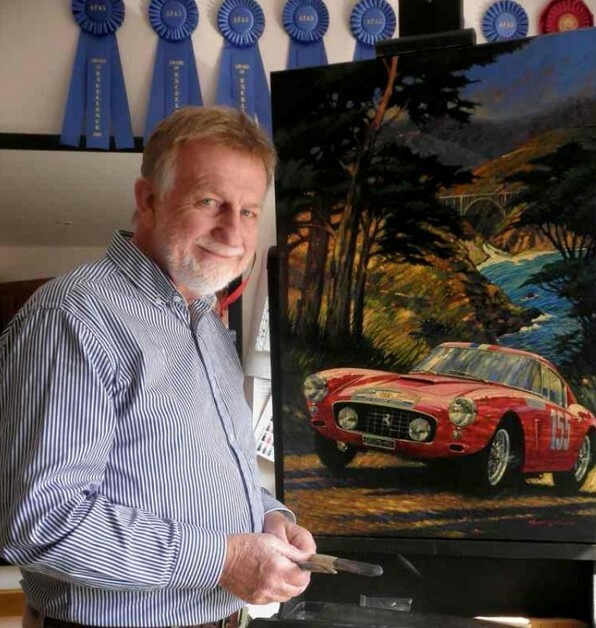 What kind of advice would you give to young automotive artists? That's a good question. I think the youngster has got to be fanatical. My wife thinks I am completely obsessed by old cars and drawings. She thinks I am working but I am not working, I just enjoy it so much. I think artists need to get excited inside at whatever they paint, even if they are not being paid. It is quite hard these days to get any recognition but even if a youngster doesn't get any, they should not give up. I also think their work should be different from other artists. You do see exhibited work which is all very similar. How do you get your own signature style? When I was working in advertising, I was quite art deco which no doubt you can see a bit of that in my painting. That's not intentional, it just comes out that way. My advice to any youngster, whatever they are doing, is to just keep drawing and let it come out naturally. When I go on holiday, which is not very often, I always take a small sketch book and after about a day, I want to do some drawing. You need this desire in you which drives you. Don't be put off by other people. Be true to yourself. Barry Rowe's book is available on Amazon.